When I heard of the theme for IMBB #24, cooking in 30 minutes, and to top it off it has to be a full meal, it got me excited. To me a full meal means it has to be of various nutrients, enough to satiate hunger and to sustain through the day or night. To a Chinese, the fastest and easiest all in one meal could only mean one dish, yes, fried rice. We Chinese fried rice like it is nobody’s business. There is no standard rule, no recipe to follow and every cook fried their rice their own personal way. Our fried rice does not mean just frying the rice, we add in whatever fresh ingredients we have in the pantry. We throw in this and that, whenever we see fits. In other words, fried rice is basically a dump and fried dish, albeit the prior washing and chopping. In my opinion, fried rice must be originated from those genius housewives that have plenty of leftover rice everyday and came up with ways to make use of it. Cooked rice from last night dinner could be a quick nutritious whip up lunch for today. Whatever fresh leftovers, could be the extra handful of long beans or the two sticks of carrots or the last chicken fillet, can then be used up to make this magical fried rice. Using the leftover rice was actually the key, as I have been told, since the rice is drier and more tough, thus after frying, it will be at the right texture. In most Chinese fried rice, the basic secret is in the sauce. Yes, the sauce added when we fried the rice. As far as I usually see, there are two distinct types of fried rice, the white ones or the brown ones. For the white fried rice, it could mostly mean the absence of the dark soya sauce, which is usually used for browning in Chinese cooking. It does have taste too; therefore white fried rice and brown fried rice taste somewhat different, but be careful with the dark soya sauce, as too much added, your dish would be bitter. Usually the white fried rice is added flavour with pepper while brown fried rice is usually heavily laden with soya sauce. As for me, I have never ever fried rice two times the same way. The basic idea is there, but there are always different ingredients, different mixes of sauces thus different tastes. I fried rice numerous times as it’s my trusty quick nutritional whip up of a full meal. Since there are no ‘proper’ recipes for fried rice, in my context, I would just suggest what is there to add into your fried rice, your take. It is real quick, especially with leftover rice, it could even be in 15 minutes, along with all the preparation, but if not, I’m sure you can cook the rice first, which takes only about 13 minutes. Be careful to add less water/no water as freshly cooked rice are slightly on the wet side, and you do not want a soggy fried rice. Ultimate fried rice has to be fluffy and every grain is separated. So overall, you will have a complete meal in less than 30 minutes! Shallots – my grandma taught me this, as it imparts the important aroma in the every fried rice. Always fried the shallots first, till slightly brown, then add the rest of the ingredients. Onions – in addition or in absence of the shallots, this could be a good substitute. Brown the onions well too. Eggs – it is this is an essential to seal in all the flavours of the fried rice. The secret is to throw it in at the end, mix thoroughly with the fried rice and the flavour is sealed in with extra kick! I learnt this from Ah Ma too, as not all Chinese cook does it, but I believe most of it does. Meat gives fried rice its sweetness and the full flavour of it. Though not necessary, but with it, your fried rice would be more kingly tasty and of course, the needed protein. Usually one kind of meat is use, in order to maintain its simplicity and not to complicate the flavours too much. Chicken – boneless chicken are usually sliced and dice into small bite sizes to be used in fried rice. This is the most common meat next to pork. Pork – a Chinese favourite red meat, really sweet and juicy and totally gives the fried rice a distinct taste. Usually chopped up, or sliced and even roughly minced for some. Beef – though seldom used but I had ate some in restaurants, something different but nice too. Prawn – this is actually the secret to a real fried rice fragrance and tastiness. In oppose to what I said, prawn can be added along with any other meat, it is after all seafood, but it serve the same purpose, and definitely do it much better. Veggies are good additions to fried rice to add in the nutrition and also making it more complex in tastes, textures and presentation. Long beans – these veggies pack a good crunch to the fried rice, thus bringing the texture to the whole new layer. It is good for ya and just right with the fried rice. Carrots – carrots also pack a good crunch to the fried rice. Have it sliced thinly or finely chopped. Not to mention it add good colours to the fried rice. Who doesn’t love orange? Spring Onions – though I do not always add this in, as I seldom buy it, they come in huge bunch and I just seldom get to finish it. It is usually used for garnishes in dishes, in this case it is a good addition to fried rice, especially good with the brown ones. Herbs – yes you could add in any herbs you think is right, like fresh Chinese parsley, or basil or even mint. I recently ate J’s mum brown fried rice with mint; it was tasty and refreshing with every bite on the mint. 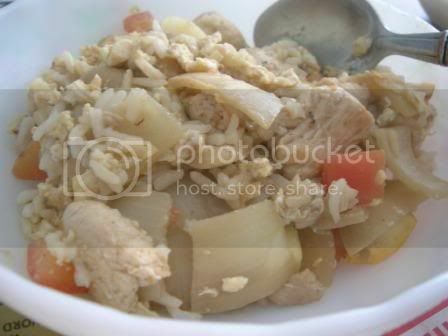 Soya sauce – main base for the saltiness in the fired rice. We seldom use salt in this.